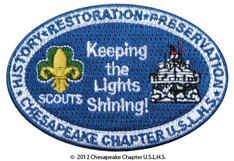 Scouts Patch Program – 2019 Maryland Lighthouse Challenge – Chesapeake Chapter U.S.L.H.S. Any Boy or Girl Scout that completes the Maryland Lighthouse Challenge is eligible to receive the Chesapeake Chapter, U.S.L.H.S. “Keeping the Lights Shining” Scout Patch. To earn the Chesapeake Chapter, U.S.L.H.S. “Keeping the Lights Shining” Scout Patch, the scout must complete the Maryland Lighthouse Challenge, September 21-22, 2019. The Scout must collect the “completer” souvenir to qualify to receive the patch. Submit completed application form signed by the Scout’s troop leader.